I am currently watching the countdown to the royal wedding! And WOW want to talk about a BIG DEAL! This wedding is going to be awesome…I’ve not been very interested in it until my Grandma reminded me that we are actually RELATED to Kate! I know, pretty cool! My Moms side of the family are Middletons…guess our invite got lost in the mail, huh cousin Kate? So I didn’t end up staying up to watch it all night but I did get to see clips this morning and WOW. Seriously WOW! What a dream world they live in. I was looking at VP arrivals and everyone there was some kind of royal! That is amazing..makes me just think about if I was a princess:) Maybe someday Harry! 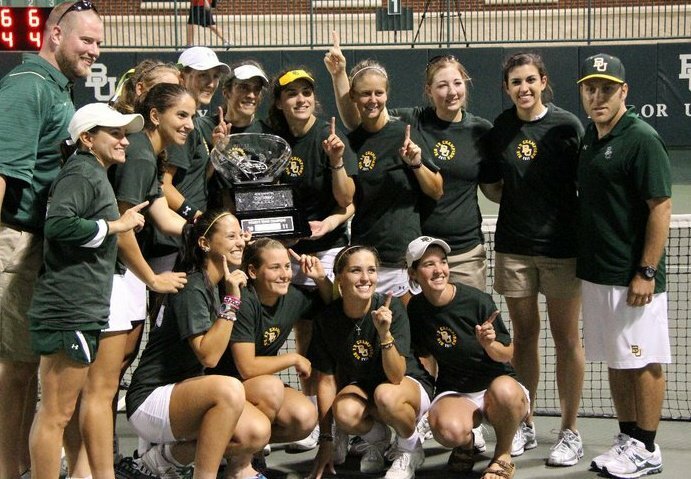 Thursday before Easter break Baylor womens tennis stepped up to the court and won the Big 12 Championship. “It’s been a long and hard fight but we are so blessed!”Said freshman Abby Stainback. The girls fought hard to stay in the runnings after a slip up earlier in the season. 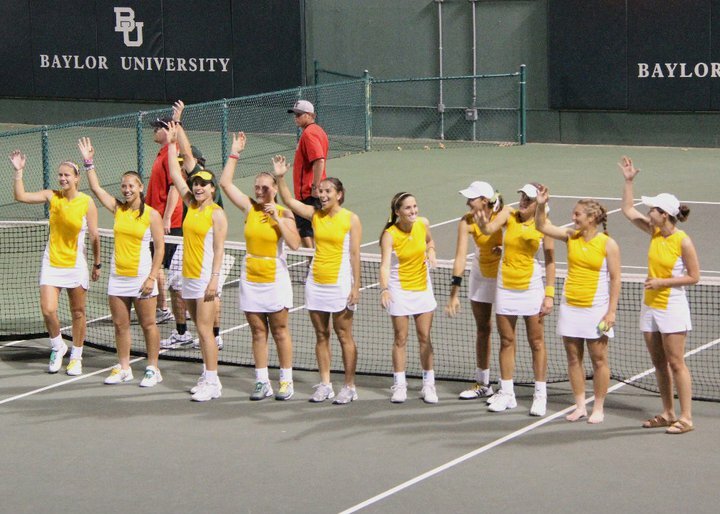 If the women win this weekend it will be the sixth consecutive Big 12 Championship title. 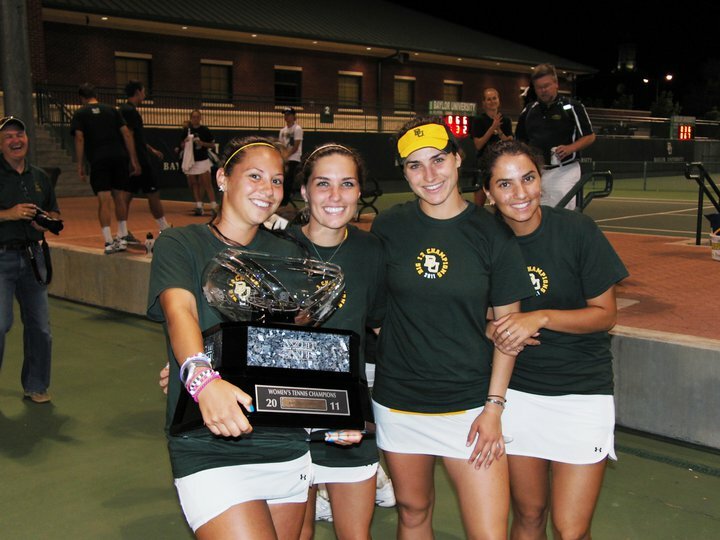 Baylor has won each of the last five tournament championships, entering as No. 1 seed each time. The Lady Bears are the No. 1 seed this weekend. Bears have beat many big school including, A&M, Texas Tech and even University of Texas. The bears are currently ranked as number 7 after being ranked as high as 3 earlier this season! “It’s been a great season, we’re going to give it all we’ve got this weekend and hopefully go far in the tournament!” Said Stainback. >This weekend Baylor will host a fashion show filled with garments from the best of the best, seniors that is. 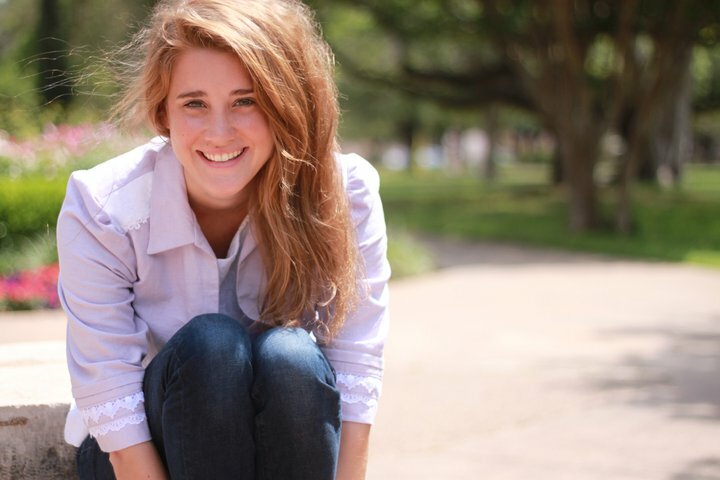 The Baylor Senior Fashion show is a show filled with Senior Fashion major’s final collection. It will not be a night to miss. At 2 and 7 p.m. on May 1, in the Barfield Drawing Room there will be a runway set up to show the seniors collections. Visual Merchandise students coined the theme for this year’s big night. “Going Vogue: A Reflection In Time.” Some say it was a play off of Sarah Palin’s ‘Going Rogue’. Through patterns and nights of sowing the designers have given all of their time to this day. “It’s a ton of work even just getting all my models to be able to come and get fitted has been tough.” Andie has 6 models walking this weekend showing a total of 12 pieces. “My favorite outfit is probably the wide leg pants with the floral top.” Day sowed all of her outfits and sketched them as well. In preparation for the show Day has some special guests to get her models runway ready. “I have some friends coming in to town to do hair and makeup. Their names are Liz and Britain. I met them through movies I styled for and they did hair and make-up. Their cool, (they) lots of tattoos.” Day said. This is a picture of Tori Poole modeling one of Andie Days jackets that can be seen in her senior collection. >Emergency Tornado sirens blared their horns Tuesday night as storms containing hail and strong winds rushed in from the west. Many Baylor students hurried to seek shelter at home, library and basements on campus after receiving a text followed by a voicemail around 8:45. Whitney Warren, sophomore communications major, had a different situation when it came to seeking shelter. “I was outside running to pick up t-shirts from a friends house. The skies were turning really dark and it was becoming very windy.” Warren said. As the night went on Baylor students stayed safe in bathrooms and closets. “My roommates and I huddled in a closet for about 30 minutes!” Said BriAnn Dorris, sophomore social work major. Tornado warnings were in effect at one point Tuesday night for all of McLennan County because of the strong winds and hail, but by around 9:30 p.m., the warning area had been taken back to areas south of Waco and at 9:45 the counties warnings were finished.”It was a very frustrating day for me! I was in that presentation room for 5 hours thanks to the storm and by the end we were all hungry, tired and ready to be home.” Said Poole. 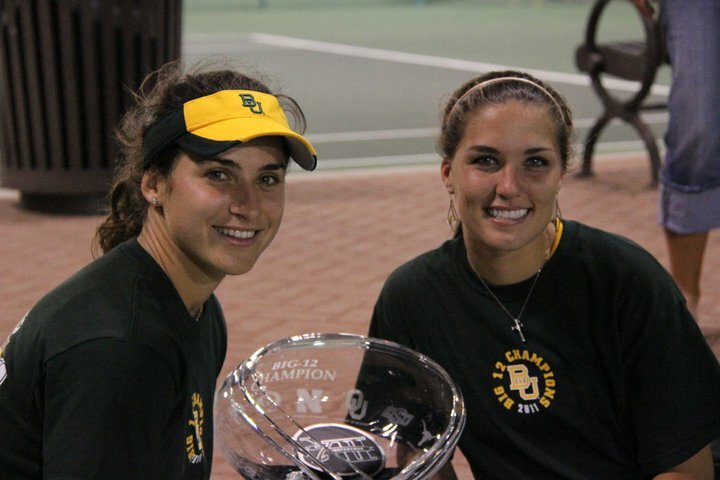 While no tornado touched down in Waco it was a night to remember for Baylor students. Many are very thankful for the alert system Baylor has set up, “without my parents here, I would have had no idea about how bad the storm was going to be,” Warren recalled. “I got the voicemail and immediately went home instead of driving to get groceries like I had been planning.” Said Dorris. So thank you Baylor for keeping us dry, safe and away from the harm of a tornado. Every year since 1934, Baylor University dedicates a day to the Bears’, diadeloso, the school’s mascot. It is a collegiate holiday for Baylor and many students couldn’t be more excited. “It’s my first DIA and I can’t wait!” Said Jessica Wilson, freshman, Public Relations major. Students seem to hype up the day so much that many professors don’t both having class the Friday after. The day is filled with fun on campus, tables from many Greek organizations can be found along with other campus social groups. 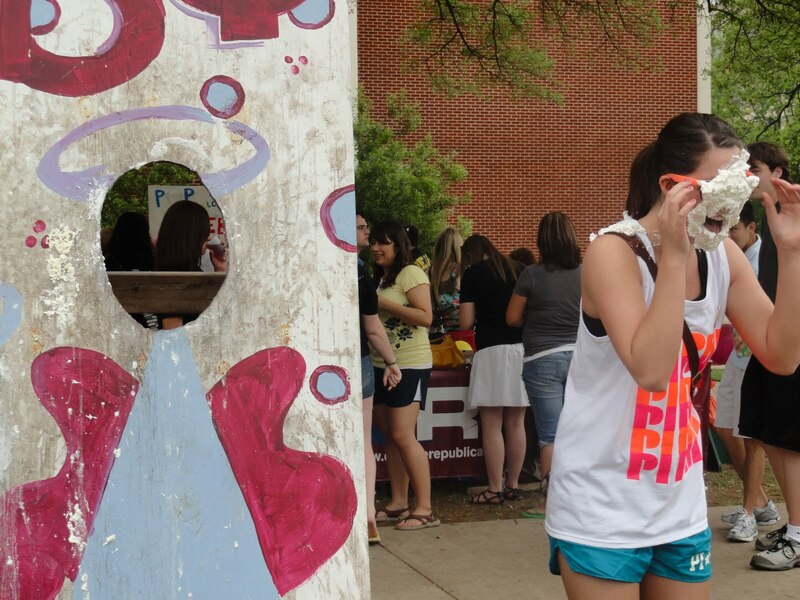 “Last year I worked the Pie a Pi Phi booth, it was hilarious!” Said sophomore communications major, Whitney Warren. 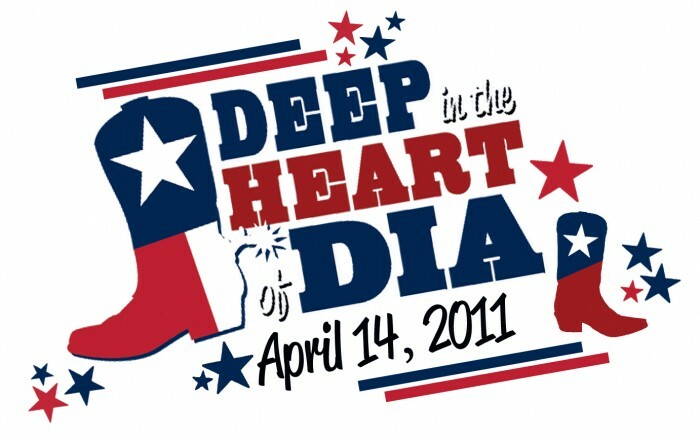 This year Baylor has decided on the theme of ‘Deep in the Heart of Dia.’ Tanks will be available in all campus housing lobbies or cafeterias. Off campus, 10Th street sponsors their own mini DIA by renting jump houses, and the long awaited fraternity men showing off through a basketball tournament. Last year the men were surprised with a visit from some other players, the Baylor basketball team to be more specific! The men rode up in a golf cart for their arrival on 10Th street. 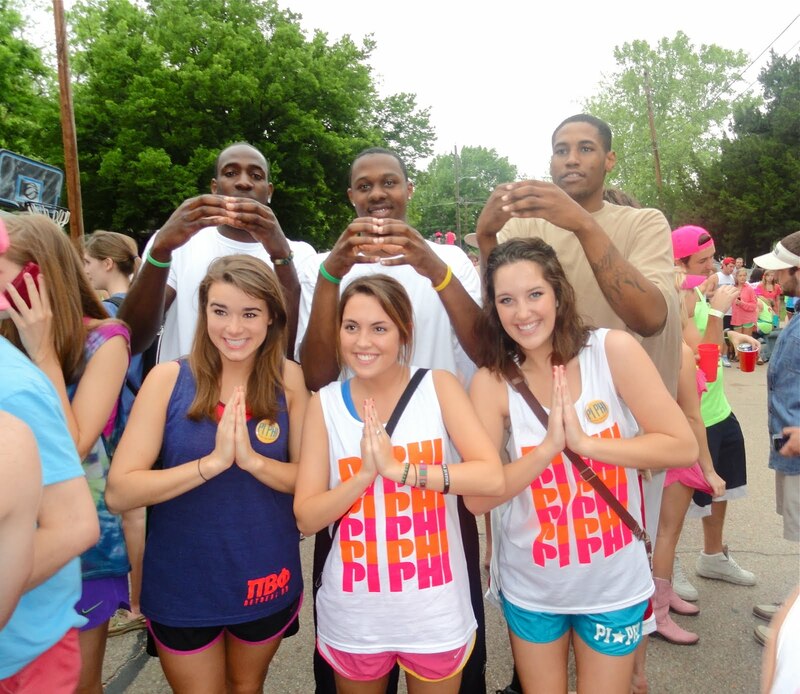 Swarmed with sorority girls anxious for pictures, as the fraternity brothers seemed to just cross their fingers that they weren’t about to be challenged and ultimately publicly humiliated! Most fraternities have house parties with water slides, and other forms of entertainment. 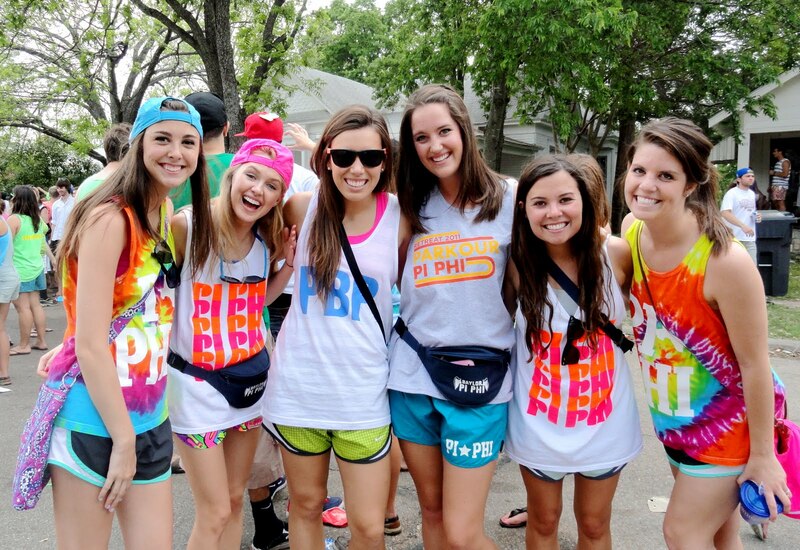 Sorority girls dress out in Nike shorts and tanks that represent their clubs. Neon is the color scheme of the day. While many Baylor students keep it “fratty”, professors are excited for the day off as well! It is a win win day for both staff and students! So enjoy the day off and be safe!